Part of the Q-Series lineup, the Innov-ís NQ3500D is the ideal machine for hobbyists of all skill levels. Take advantage of the 290 built-in sewing stitches, or make your own with the Brother-exclusive My Custom Stitch™ feature. Easily import designs from your USB memory stick, expanding your design capabilities beyond the generous 173 built-in embroidery designs, which include 35 designs featuring Disney characters. Your creativity has virtually no limits. Let your creativity explode with the Innov-ís NQ1400E embroidery-only machine from the Q-Series lineup. 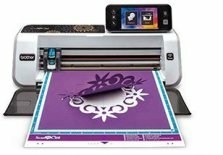 Choose from any one of the 138 built-in embroidery designs, and enjoy editing ease with the ability to resize, rotate, reposition and combine designs. Embroider all of your projects, from home décor to clothing, on the large 6″ x 10″ embroidery area. With the Innov-ís NQ1300PRW, sewers will take garment construction to new heights with 290 built-in sewing stitches and the My Custom Stitch™ feature, which allows you to create personalized stitches. Whether you’re sewing silk or denim, the Automatic Height Adjuster™ (AHA®) feature will help deliver smooth, even stitches every time. Feel inspired to tackle projects you never thought possible with the Innov-ís NQ1300PRW, part of the Q-Series lineup! Introducing THE Dream Fabric Frame, your key to unlocking the true potential of your advanced Brother Sewing and Quilting Machines. Now you can make your workspace virtually endless. The Dream Fabric Frame includes the SureStitch™ Stitch Regulator for enhanced control during free-motion sewing. 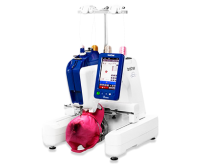 And when used with Brother machines equipped with multi-function foot controller capabilities, you will enjoy built-in features such as thread cutting and single stitch sewing - all at your fingertips. Made exclusively for Brother by the Grace Company, THE Dream Fabric Frame gives you an expanded workspace for endless creativity and more freedom to create – all in a space smaller than you ever dreamed of. Measuring at just 3 feet x 5 feet, it’s perfect for just about any size room, yet it handles everything – from garments to king-sized quilts! It’s also versatile – mount a new machine easily, in just minutes. THE Dream Fabric Frame opens up an exciting new world of embellishment for your Brother–made machine and accessories. Easily create thread painting, free-motion couching, applique, needle felting, and more! If you have a passion for quilting and sewing, you’ll enjoy the industry-first MuVit™ Digital Dual Feed foot plus 11.25” workspace – you get more than 10% more space for creating your next vision, such as a quilt or horse blanket. Have you been looking for a machine to take to Quilt Club meetings? The NX570Q features not only a variety of quilting stitches and sewing accessories, it also includes a quilting table for added support, as well as a knee lifter for easy fabric control as you piece and sew your quilts. The large extension table expands your sewing work area, has conveniently placed ruler, and has adjustable, rubber-tipped legs for stability. ScanNCut DX Innovis-Edition: What's the formula for perfect crafting success? Just add imagination! 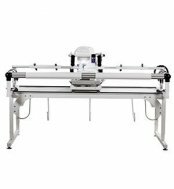 Now, the only home and hobby cutting machine with a built-in scanner has essentially everything else you need to create stunning projects. ScanNCut2 will help take your cutting and crafting to a whole new level. ScanNCut2 features a super-large LCD touch screen display (30% larger than before) for super-clear, easy to use images, plus a huge 12" x 24" scanning area to expand your scanning and cutting horizons. Color and specifications vary by model.